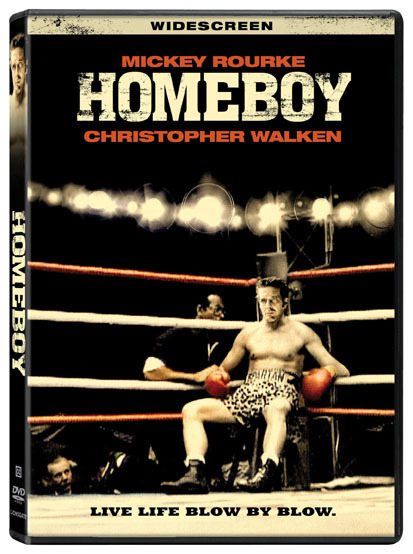 Academy Award® nominee and Golden Globe® winner Mickey Rourke (The Wrestler, Best Actor, 2008) and Academy Award® winner Christopher Walken (The Deer Hunter, Best Actor in a Supporting Role, 1978) star in Homeboy, a dramatic tale about a washed up boxer who agrees to climb in the ring one more time for the big fight of his life. Available for the first time on DVD, the film has been newly remastered for a widescreen presentation and features an original score by legendary musician Eric Clapton. Homeboy punches its way into stores on September 1, 2009. Johnny Walker (Rourke) is a punch-drunk, alcoholic boxer whose best days are behind him. In an effort to raise money for his girlfriend’s financially troubled arcade, he considers an offer to take part in a heist of a jewelry store from Wesley Pendergrass (Walken), a promoter and smooth-talking hood. However, Johnny is tempted back into the ring by a large prize payout, even though a blow to his fractured temple bone could kill him.